Part III of Listwè Basketball An Gwanbé presented Sout' City's teams in the National League; Schools Leagues teams from Grand Bay; Grand Bay's basketball courts over the years; and sponsorship of Grand Bay teams in the National League. "4-on-4 HOOP JAM": Adding to sports entertainment in Grand Bay was a basketball tournament dubbed, "4-on-4 HOOP JAM". That round-robin competition was introduced in 2009 and was run annually until 2015. Participating teams came from southern villages, viz. Bagatelle, Dubique, Petite Savanne, Pichelin, Tete Morne, and of course Grand Bay, and as many as 8 teams competed in Hoop Jam in any one year. The competition sometimes complemented the Grand Bay Basketball League. Julian Pacquette was Hoop Jam's main organizer and games were a shorter version of regular basketball games, but of 90 minutes "running time" duration. Teams carried names such as Back Street Boys, CRC, Tear Drops, Team Converse, West Side, Young Chemerz and others. Pacquette revealed that there was a women's tournament in one edition of Hoop Jam. However, it is interesting to note that Unstoppable Girls - Pierre Charles Secondary School's all-girls team - actually played against the men's teams. One of the other women's teams hailed from Dubique. According to a Dominica News Online article posted on 24th January 2011, referring to Unstoppables in one of their matches stated, "They certainly lived up to their name in the first-half and remained tied to their much older male competitors, Team Converse, for the majority of the game. The Converse boys managed to get the win despite the amazing number of three-pointers the Unstoppable Girls put in." Team Converse won the 2011 Hoop Jam championship. Sponsorship for Hoop Jam over the years was provided by L.A. Dupigny, Tonge Incorporated, New India Insurance and others. Unfortunately, the "4-on-4" was discontinued due to discipline and other issues, but Pacquette hopes "to bring back the excitement (of Hoop Jam) when the Centre playing field and court are renovated." GRAND BAY BASKETBALLERS WHO EXCELLED IN OTHER FIELDS: Several basketballers from Grand Bay have excelled in other fields, including culture, politics, medicine, other sports, etc. The following is certainly a shortlist. Topping the line-up is Pros' and Net-Cutters' Pierre Charles (Deceased); he served as Dominica's 5th Prime Minister. Ryan Anselm (Home Boys, Pros, West Side, national player; assistant coach to Dominica's national team) currently serves as Technical Officer/Projects & Services in the Agriculture Division, as well as FAO National Correspondent. Brothers Akim & Shaka Dangleben (Pros, Thundererz Premier, Young Guns) are both Architects with the Government of Dominica. Lenny Dangleben (Sixers) is a Police Officer and a qualified cricket umpire. Willie Fevrier (Nationals) became Executive Director of Dominica Planned Parenthood Association. Adriana Henderson (Pros Sisters/Madech Sisters) was a Teacher at Grand Bay Primary School for several years, then Deputy Principal of Pierre Charles Secondary School. She has also excelled on Dominica's cultural landscape as the current "Bèlè Queen" and leader of Tradibelle Cultural Group. Felix Henderson (Pros, Pros Junior) is "Chèf Kwéyòl" himself, a nationally-awarded promoter of Dominica's Kwéyòl language, and a DBS Radio Broadcaster from the 1970s to current. Lambert Henderson [deceased] (Pros) taught Woodwork at the Grand Bay Primary School. "Lambie", a dual-sports personality, even had Dominica's Southern Cricket League named after him. Patrick Henderson (Pros) served as Director of Dominica's US Peace Corps Office for several years. Lionel Laville (Nationals) became a senior Government Surveyor. Kinnard Letham (Pros Junior, Pros I) earned a Doctor of Medicine degree, later specializing in General Surgery & Critical Care; he currently practices in the USA. Bonti Liverpool (Pros, Sixty-Sixers; Thundererz's coach) headed the Grand Bay Credit Union, served as Chief Scout Commissioner, and is the CIBC 2012 Unsung Hero. Julian Pacquette (Home Boys, Smashers, Sixty-Sixers) is the Instructor-Trainer in the Youth Skills Training Programme at the Youth Development Division. John Roach (Ogan Stars, Sixers; also a basketball referee who officiated in the GBBL and National League) is the current Chief Youth Development Officer at the Youth Development Division. Augustus St. Hilaire (Nationals, Pros) is a versatile musician. He was a member of the "Ebonites" band from Grand Bay and a founding member of "Black Machines". He subsequently moved to France in 1989, and four years later to Germany where he formed "The Reggae Ambassadors" band. "Embert" Stowe (Nationals) is a distinguished pharmacist, and a calypsonian who competed as "The Saint". 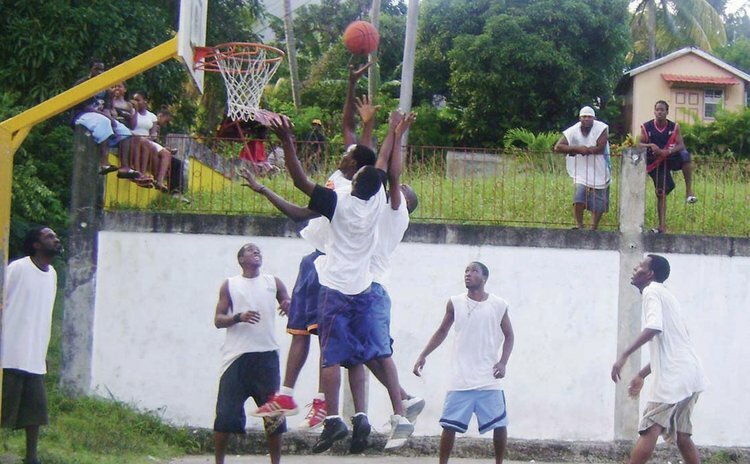 GRAND BAY'S BASKETBALL LEAGUE: Grand Bay was one of Dominica's first communities to organize its own community basketball league. The latter was known as the Champion Bubblers Mamas Basketball League (CBMBL), and later as the Pierre Charles Basketball League (PCBL).